I'm designing an Android app for a client. Since it's confidential, I made up a similar scenario. Say I'm designing a system to order pizza. 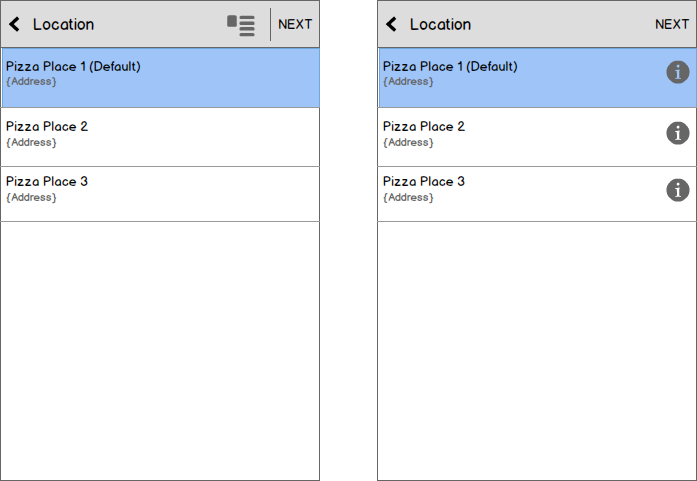 One of the steps in this multi-step process is to choose a location where I want to pickup my pizza. So on the screen, I need to be able to select a location then go to the next step, or look at the details first (like directions to the location) before selecting the location. Usually to view details, the user would touch the item and drill down to the details. But I want to use the touch gesture to select the location since viewing details is secondary. So now I need another method to drill down to the details. I have two solutions but I don't know which is better, what's the standard or maybe there's a completely different that solution I haven't thought of. Solution 1: User selects location then taps the details icon in the action bar. Solution 2: User touches the information icon to the right of the item. it's fine, but more appropriate will be when user can touch whole area to see details and touch icon on a right to choose that location. Details under touch of whole area of cell is more intuitive for any content view actions. On the right you can use simple text "choose" instead of any icon - this will be nice call to action and much more clear for a user what to do..
Not the answer you're looking for? Browse other questions tagged mobile android selection master-details or ask your own question. Best way to select quantity of items for an eCommerce mobile application? how to subtly indicate that an address is “mappable” in a mobile app? Inline checkbox that excludes previoius possible input, how do I combine this elegantly?